Today, the AFL premiers West Coast Eagles. The team finished in eighth place, thanks to a wildly fortunate final game against a lackadaisical minor premier Crows team, with a home-and-away record of 12-10 with a percentage of 105.7 – a goal and a minor ahead of a Melbourne team that coughed up a hairball of a game the day before. 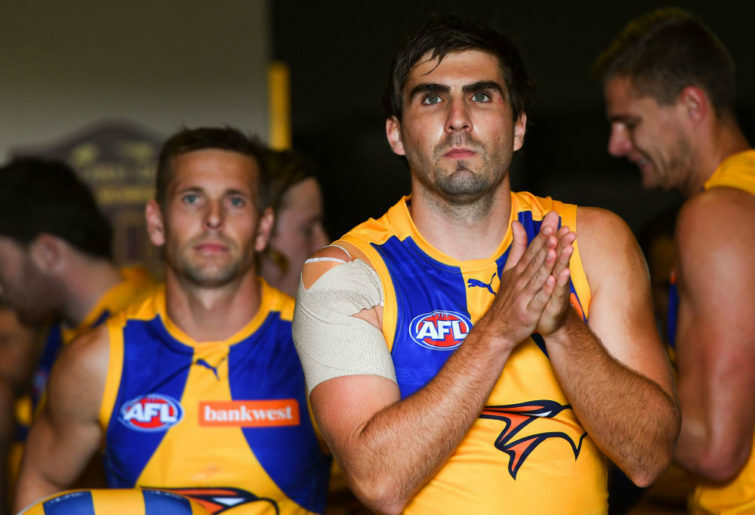 The Eagles followed that up with an after-the-overtime-siren goal at Port Adelaide before losing in a semi-final they had no right to have reached in the first place. Were not particularly high. Nobody had them improving significantly over last season; the highest prediction was seventh (The Arc), with a few eighth places strewn about. The consensus placement was 12th place, between St Kilda above them and (ahem) Collingwood below. We all look really smart right about now. 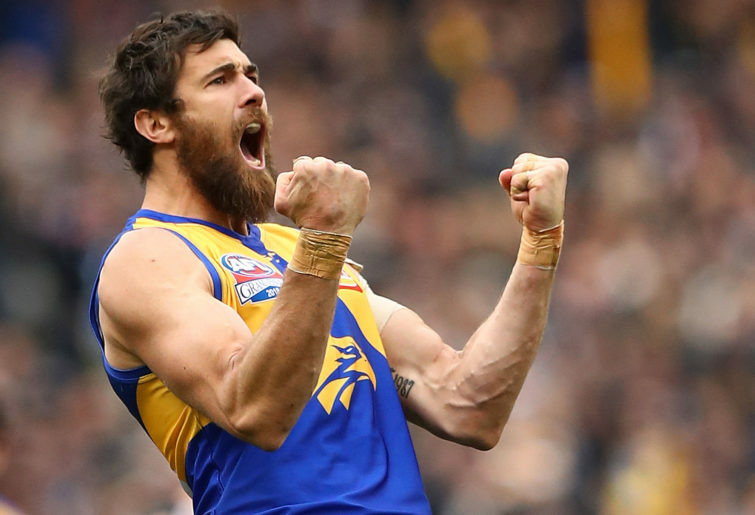 Coming into the season, the players who were considered to be in the top 50 in the league by the AFLPA or The Roar included quite a few names: Josh J Kennedy (top 20), Jeremy McGovern (top 40), Nic Naitanui, Elliot Yeo, and Luke Shuey. With a flourish, placing second on the ladder with a record of 16-6 and a percentage of 121, having started the season 10-1 and coasted into the finals. Thanks to the Tigers’ collapse in the prelims on the other side of the bracket, the Eagles were able to not only stomp on Melbourne at home, but be the higher-seeded favourite at the MCG for the grand final, where (and stop me if you’ve heard this) they came from five goals back to win with a Dom Sheed goal in the final two minutes. They defeated Collingwood 79-74 in one of the closest grand finals since they last won the flag a decade ago. Five years since the Eagles last missed finals. That was a ninth place, 11-11 finish in 2014. Only Sydney has a longer current streak of finals appearances. In the last four years, the Eagles have won 66 games, the most in the AFL. It’s been nine years since they last took the wooden spoon (4-18 with a meagre 44% in 2010). They were the last 16th-place spoon before the expansion brought the total to 18 teams over the next two years, giving those new clubs a reservation on last for a year or two. According to our patented “ELO-Following Football” rating system, the team started this year in 11th place right around average at 49.0 (the mean of the ELO-FF system is always 50), but immediately rose to 61.4 by Round 4. After a bit of a stall, they made it to their season high of 72.9 and second place following their Round 9 rout of Richmond at Optus Stadium. Since then, they’ve done a gradual slide down to their end-of-season rating of 63.2 due to a combination of market correction and forward injuries, in sixth place. Three September victories added eleven points to their rating, and they’ve landed in second place overall at 75.2, behind only Geelong. The primary difference in the West Coast rankings elsewhere is that they reached their pinnacle placement earliest in the ELO-FF system; the others had them still moving higher as late as Round 14 in some cases. They were sitting around third to sixth in all of them before finals, and most have them still in that general range: The Arc has them third, behind Richmond and Melbourne, and FMI has them fourth behind those two and Geelong. Final record: 16-6, second place during the home-and-away season; finished at 19-6 overall after winning the Grand Final 79-74 over Collingwood Magpies. Betting Line expectations: 13-9. The Eagles went 14-8 against the spread this season, best in the AFL. ELO-Following Football forecasts: Our game forecasts pegged them at 15-7. AFL.com.au game predictions: The league’s prognosticators had them just 12-10. The Roar predictions: Corporately, the Roar picked them to win 14 and lose 8; the individual punters totalled 77-44. The Age forecasters: 15.5 and 6.5; individual picks added up to 170-94. My own game-by-game predictions predicted them to go 14-8. If there’s any game in a premiership season you’d want to throw out, it would certainly be one of the losses, and most of those were to recognised good teams – Sydney (twice), Adelaide, GWS, and the Demons in Round 22. But the one non-finalist that beat them really beat them: North Melbourne, in Round 19, by 40 points in Tasmania. Beyond the fact of the loss itself came the way they lost – after an Elliot Yeo goal three minutes into the second half, the Eagles played the last 55 minutes of the game scoring just four minors, while the Kangaroos slowly pulled away to double them up after being behind by three following the Yeo goal. Best & Fairest finish: First (his second such medal). Received 15 votes for the Brownlow medal, second most on the club. Last year’s result: Also first (12th overall). Eighth in 2016.
Notable games: Two dominant games (Round 9 and Round 20), three prominent games (Round 4, Round 13, and Round 18), and one notable game (Round 19). All-Australian 40-man roster. ELO-FF Top 22. First team defender. Best & Fairest finish: Fifth. His sixteen votes for the Brownlow were the most of any Eagle this season. Last year’s result: Fifth (77th overall). Also fifth in 2016.
Notable games: One dominant game (Round 10) and four prominent games (in Round 3, Round 5, and Round 15-16). All-Australian Center. ELO-FF Top 22. Best & Fairest finish: Sixth. His six votes for the Brownlow were equal fifth on the club. Last year’s result: Third (56th overall). Was fourth in 2016.
Notable games: Two dominant games (in Round 4 and Round 9) and one prominent game (in Round 17). All-Australian Half-Back. ELO-FF First team defender. Best & Fairest finish: Ninth. Received 11 votes for Brownlow medal, third most on team. Last year’s result: Eighth (156th overall). Notable games: One dominant game, in Round 9, two prominent games, in Round 7-8, and two notable games in Round 2 and Round 4. Best & Fairest finish: Third. Got six votes for the Brownlow, equal fifth on the club. Last year’s result: Seventh (83rd overall). Notable games: Three prominent games (Round 2, Round 6, and Round 11) and one notable game (Round 16). 6. Jack Redden – 186 points (64th overall). Third in points during finals for Eagles. Best & Fairest finish: Second. Received ten Brownlow votes, good for fourth on team. Notable games: One dominant game (Round 17) and two prominent games (Round 7 and Round 20). Best & Fairest finish: not in top ten. Received the Norm Smith medal as the Outstanding player in the Grand Final; was also the top point getter throughout finals for West Coast. Last year’s result: fourth (65th overall); was 2nd (22nd overall) in 2016.
Notable games: One prominent game (Round 3) and two notable games (Round 21, Round 23). Best & Fairest finish: not in top ten – only played 15 games. Last year’s result: did not play (ACL) last year. Sixth (53rd overall) in 2016.
Notable games: Two notable games, in Round 9 and Round 16. Best & Fairest finish: Fourth. Notable games: Two notable games, in Round 18 and Round 23. =9. Josh J Kennedy – 81 points (159th overall) Fourth in finals points for West Coast. Best & Fairest finish: not in top ten. Last year’s result: 2nd (13th overall). Was first (4th overall) in 2016.
Notable games: One dominant game (Round 11). West Coast had seven top 100 players and 12 top 200 players in the 2018 ELO-FF meta-rankings. Averages would be 5½ and 11, respectively. Tom Barrass – 41 points (18th place). One notable game (Round 8). Lewis Jetta – 29 points (20th place). Voted Clubman of the Year. Chris Masten – 52 points (15th place). One notable game (Round 4). Willie Rioli – 61 points (13th place). Tenth in Best & Fairest voting. Dom Sheed – 59 points (14th place). Second in finals points on the club. One prominent game, in Round 3. Brad Sheppard – 66 points (12th place). Eighth place in Best & Fairest voting. One notable game, in Round 20. Current list of draft picks: 20, 22, 61, 72, 76, 94. Backs: Tom Barrass, Tom Cole, Liam Duggan, Shannon Hurn, Lewis Jetta, Jeremy McGovern, Will Schofield, Brad Sheppard. Midfielders: Brendon Ah Chee, Braydon Ainsworth, Andrew Gaff, Mark Hutchings, Chris Masten, Jack Redden, Luke Shuey, Daniel Venables, Elliot Yeo. Rucks: Nic Naitanui, Tom Hickey. Forwards: Oscar Allen, Jarrod Brander, Jamie Cripps, Jack Darling, Josh Kennedy, Willie Rioli, Liam Ryan, Dom Sheed, Nathan Vardy, Jake Waterman. They seem poised to stay atop the heap, although they will have to deal with not only a Richmond team seeking retribution but a Collingwood club seeking revenge, not to mention a handful of other teams capable of making a run to the 2019 Grand Final. After all, this year’s finalists came into the season having finished eighth and 13th the year before! We see the Eagles landing in fourth place this coming season – the tools are there but the hunger may not be. Think of it this way: the year following each of their three previous flag, they’ve placed third, fourth, and fifth. So we’re just taking the average.